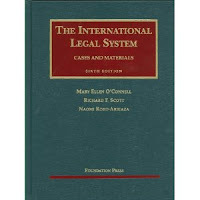 ► The 1st is The International Legal System: Cases and Materials (6th ed. 2010) (below, far right). Initially published in 1973, this Foundation Press standard has a whole new authors' lineup: Naomi Roht-Arriaza (California-Hastings) and Mary Ellen O'Connell (Notre Dame), IntLawGrrl and IntLawGrrl guest/alumna, respectively, along with Richard F. Scott (Thomas Jefferson). The table of contents promises an organized and varied survey of public international law, in general and in specific areas like the environment and the economy, human rights and the use of force. This 'Grrl, who's teaching intlaw in the fall, plans to give it a try. ► The 2d is International and Transnational Criminal Law (2009) (near right). This 1st edition Aspen publication is the work of 3 of our colleagues, all affiliated with Georgetown Law: Julie R. O'Sullivan, David Luban, and David P. Stewart. 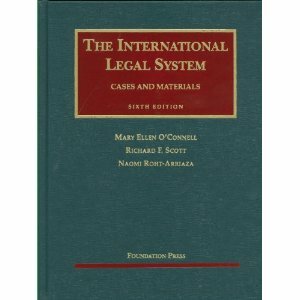 It joins others in the ICL field, including the casebook, now in its 2d ed., co-authored by IntLawGrrl Beth Van Schaack.